It’s hard to believe that it’s almost been a year since Cataclysm was first released. There’s been a lot that has happened – good things, bad things, and things in between that people really aren’t sure about. The expansion on a whole seems to be controversial in the fact that some believe it’s been a big success, while others believe it’s been a failure. I personally think that it’s an experiment that was partially successful, but that’s for another time. As of November 29th, the beginning of the end of Cataclysm is upon is. Blizzard has said that this will be the last full content patch for the expansion, and that this will basically be the end for updates before Mists of Pandaria comes out. This could be taken two ways: the optimistic way, thinking that we’ll be seeing MoP sooner rather than later and won’t have to do this content forever; or the pessimistic way, thinking that we’ll be doing the exact same content for a year, as we did with Icecrown Citadel at the end of Wrath of the Lich King (Ruby Sanctum doesn’t count). Unfortunately I don’t work for Blizzard, and I don’t know when they hope to release MoP. Like everyone else, I’d rather see it sooner rather than later, but we know that it will be done when it’s done. However, all that being said, I’d like to take the optimistic view. The 4.3 content patch has a lot in it. 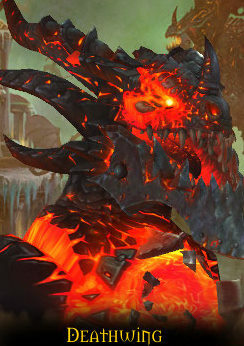 Not only do we get the new raid on Deathwing, but there are three new 5-man dungeons, a revamped Darkmoon Faire, Transmogrification, Void Storage, the Raid Finder, a bunch of new items from the raids and other content, and a whole bunch of balance changes. It would take too long to go through each one, so I’ll suggest you check out WoW Insider’s guide to Patch 4.3 to get the details about many of the new features. Briefly, I’m very happy with Transmogrification. The interface is incredibly easy to use, and I finally am rewarded for being such a packrat for all these years. I was able to have one of my favourite looks of the Tier 5 shoulders and Wildfury Greatstaff for my Druid, which really makes me happy and nostalgic. Void Storage is nice, but unfortunately a bit too restrictive. I have a lot of stuff in my bank from the many holidays that have come around, and I was hoping to empty a bunch out to free up some room. The biggest thing is that items labelled “unique” or items not soulbound cannot be deposited to VS. Many tabards, as well as other holiday things are all unique, and some of the holiday items like the Brewfest and Winter Veil gear are not soulbound, but I wanted to keep them nonetheless. So I deposited what I could, and at least freed up some room. The Raid Finder has been one of the things I’ve been looking forward to most. As I’ve mentioned before, my schedule is very weird for when I can raid, so now I can raid whenever I want – as long as there’s enough other people queuing as well. I was able to get into a group, and successfully get the four bosses currently available with little drama. We only wiped twice, and there were people taking charge of the raid to get things done. 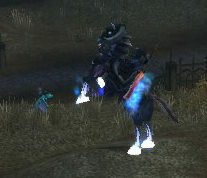 We also got Tyrael’s Charger. It’s pretty. All in all, there’s some great new content that everyone can enjoy no matter what you do. Raider, casual player, leveling player, there’s something for everyone. As I experience more of the new content, I’ll post my thoughts about some of them. In the meantime, happy exploring! As I’ve mentioned many times before, I have a great guild. I’ve been a member of it for my entire WoW career, and I don’t plan on leaving it anytime soon – not many other guilds would put up with my incredibly messed up schedule and still let me raid. Through this guild, I’ve met a number of people and formed some great friendships. However, I’ve been looking at trying something different for a little while now. Every once in a while I’ll roll an alt on another server and see what happens, which eventually just gets deleted. I lose interest quickly, and just go back to my main server. Rolling a new character somewhere that has absolutely no connection to people you know, gold, or heirlooms is very difficult. Not only does the new character start with nothing to their name, but also having no connections or a guild to talk to is quite lonely. Fortunately, there have been a few changes to make things a bit easier now. Even though I thoroughly enjoy the low level changes to Azeroth, it still takes a good amount of time to progress through levels 1-60. On top of that, I’ve wanted to try out a Death Knight tank, so that’s what I decided on. 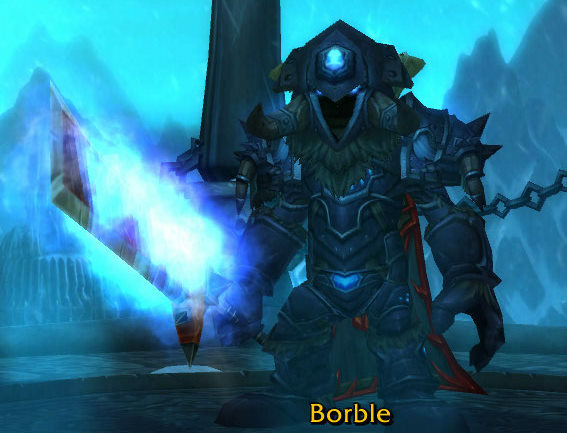 Therefore Borble, the Goblin Death Knight, was born on the Earthen Ring server. Many times, choosing a server is one of the most difficult choices that someone can make. Do you choose a low population server and have a tight-knit community? Do you choose a high population server for more people to interact with? What are the guilds like with their raiding? By going through server forums and guild websites, it’s possible to find something that works for you. My choice of Earthen Ring was for two reasons. Firstly, I wanted to try a role-playing (RP) server as I haven’t done much of it in WoW. I previously did a fair amount of RP in a previous game, but nothing so far here. (On top of that, creating this character also gave me a good idea for a submission to Blizzard’s writing contest.) Secondly, I’m a big fan of The Instance podcast and they have their mega-guild AIE on Earthen Ring. I’d love to be part of a guild like them after being in a small one for so long. Unfortunately, AIE isn’t accepting any new characters until October, so it gives me time to explore other opportunities until then. One nice thing about this is that I had my first experience with the Guild Finder option. I listed my name, gave a little bit of a blurb about myself and what I wanted to do, and applied to a few guilds that were on the list. A little bit later, I was invited and in the guild. Now I have new people to talk to and spend time with! The majority of my time so far has been spent herbing and working on alchemy, while in the queue for random Burning Crusade instances. I just hit level 61, and have not stepped foot in Outland at all. I’ve only done instance runs while herbing in Azeroth, and it’s quite possible that I won’t do anything in Outland at all by the time I’m ready for Northrend. Through this, I had my first experiences as a DK tank. I’m always terrified of trying something new – whether it’s trying a healing spec on my priest or druid, or tanking on this new DK. Because I knew that I’d never be completely comfortable with it, I decided to just jump in and see how it went. Amazingly enough, it went pretty well. The first few pulls were definitely learning experiences, as I had only ever witnessed other DKs do the tanking while I do other stuff. Very quickly I found out that being disarmed is very bad and that runes will never refresh fast enough. The other downside of doing this tanking at level 60 and 61 is that I don’t have my regular taunt yet, and only Death Grip… which is on a 32 second cooldown. Many times I need something more frequent than that. The first experiences have been good, and I’m really looking forward to continuing my journey on this new server. I hope to join AIE when possible, but until then I’m having fun in a completely new environment. Lately I’ve had difficulty having inspiration for a new post, and have been thinking about what to post about. Patch 4.2 has just recently dropped, but sites such as WoW Insider have much more comprehensive coverage of things in there than I could ever give. However, one thing that I can give is where I’ve come from through my time in WoW. Let’s take a trip with the way-back machine to Wrath of the Lich King and look back at Naxxramas. Naxx was one of the entry raids of WotLK, the other being Malygos in the Eye of Eternity. It was originally a 40-man raid at the end of Vanilla, but the difficulty level and attunement process was quite high at the time. Very few people were able to experience it, even through Burning Crusade. Thus Blizzard decided to bring it back in Wrath, along with updated items and tier armours. This tier of raiding was the first time people got to experience having the choice between 10 and 25-man groups of the same instance. They were on separate lockouts, so if someone had enough time they could do both versions of the raid to get gear faster. Personally I felt it was better suited for 25-man raiding, as it is such a very large instance, and it feels even larger when there aren’t as many people. The size of the instance and rooms were not changed from the original 40-man raid, so that probably has a bit to do with it. 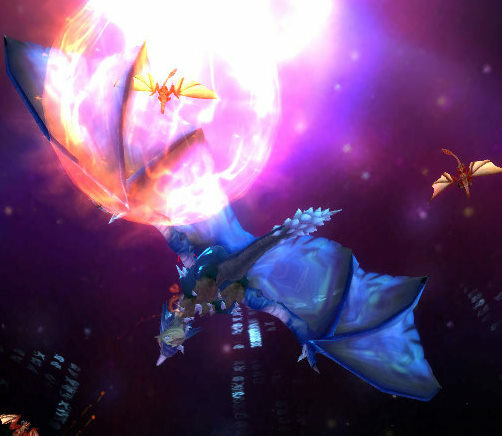 There were four wings, each with a boss at the end that needed to be defeated before moving on to Sapphiron and Kel’Thuzad (originally – later through Wrath it was possible to skip the wings and go directly to them). The four quarters were: Military (or Death Knight), Plague, Spider, and Construct. Each wing was themed with similar trash mobs and bosses, with each having their own little special thing. Back in Vanilla, Patchwerk was the DPS check for the instance. If the raid DPS was high enough to kill Patchwerk before he enrages, the group is probably ready to do the rest of the instance. Fortunately with Naxx being the first raid of the expansion, it was a little more forgiving. I never had the chance to do it in Vanilla, but I have heard that the entire instance retains much of the original feel. Fights like Loatheb are still very difficult due to the very big mechanic of not being able to heal except for a few brief seconds every minute. Heigan still requires the entire raid to dance between the flames. Kel’Thuzad is still a royal pain if you’re melee-heavy with the ice blocks. Altogether it wasn’t a bad instance, and I certainly enjoyed the time we had through it. There were certainly things that could have been improved, however. Standing out to me was the Instructor Razuvious fight in 25-man mode. It was a requirement for there to be two priests in the raid, as there are two adds that need to be mind controlled for the fight to tank the boss. In 10-man mode, there were crystals that were used for this reason so anyone could do it. Even though there are 25 people in a raid, there were a few times our guild couldn’t do that quarter because we didn’t have enough priests. There were a LOT of bosses. 16 altogether (I’m counting the Four Horsemen as one boss), and while that allowed a lot of loot to be given out, it also made for a lot of time in one zone looking at the same stuff over and over again. I’m all for a lot of content, but sometimes there’s a bit too much. Class tier item sets dropped were re-skinned Tier 3, updated for Wrath. Some of my favourite tier sets are in tiers 3 and 7, so I was quite happy when I got my sets. Along with it were some very interesting looking weapons, including Journey’s End and Origin of Nightmares (guess what spec I was during that time). Unfortunately, as much as feral Druids loved these two items we suffered the usual pains of not being able to see them while in combat. This instance was a very good raid to start off the expansion with. It was perfect for Wrath’s lore, and had a variety of fights that people had to adapt to very quickly. Thaddius and the positive/negative gimmick was always a lot of fun and very frustrating at the same time. If you ask me, that’s what raiding is supposed to be like – have fun while ripping your hair out. Good times. I don’t envy Blizzard’s creative development department. Not one bit. I do, however, have a huge amount of respect for Chris Metzen and his crew of awesomeness, as they have an extremely hard job – keeping things straight, and making the lore of the game make sense. To begin with, creating anything new and original is really difficult. While the human/elf/dwarf/etc universe was not created by Blizzard, they took something that people could recognize and put their own spin on it. A few examples of their original thinking: dragons being the protectors of the world and having dominion over a certain part of it; the Emerald Dream concept, having a complete copy of the unadultered world exist in dream form; the Titans, Sargeras, and the Burning Legion. Along with this is taking the characters that are created and making them believable. Nobody likes the perfect character who has absolutely no faults (/cough Rhonin and his raptor army), because there’s not a human in real life who is perfect. Take any good novel or movie and see the characters that people relate to the most, and look at who wrote their stories. It’s those people who you want to thank. When a protagonist is established, it must be incredibly hard to balance the good and bad. They may have some great things about them, but there can’t be any downsides – once again, that are believable. Something simple such as being clumsy isn’t a character flaw, it’s a fact of life. Not trusting anyone because you were sold into slavery as a child is a character flaw, as it’s a huge obstacle that that person must overcome. 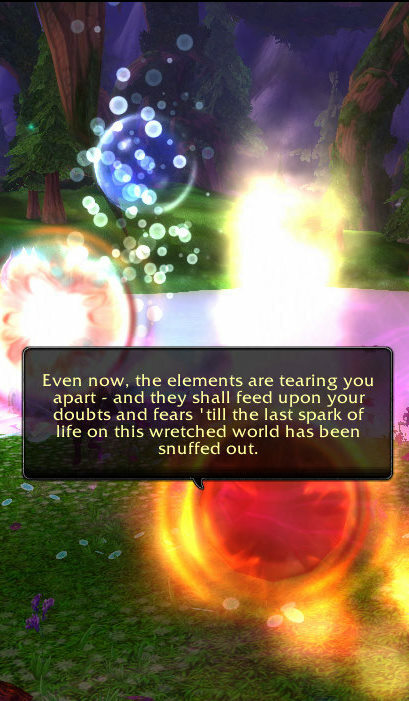 There will be spoilers for the Elemental Bonds questline of 4.2 following. 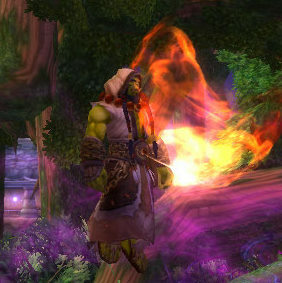 There are a number of major characters in World of Warcraft, built up over the years by the games or novels. Currently in Cataclysm, and particularly in a certain quest line in 4.2, Thrall is undoubtedly at the middle of everything. The leader of the Earthen Ring and the most powerful Shaman on Azeroth is a big thing to balance out as a believable character. The quest line that I mentioned starts just outside of Nordrassil (after breadcrumbs from either capital) with a convocation of the four remaining Dragon Aspects, the Archdruids, and the leaders of the Earthen Ring (including Thrall and Aggra). Mending the World Tree in Hyjal was the plan, but unfortunately a certain fallen Archdruid had other plans from his “master”. Fandral explains that his master has sensed that Thrall is the single biggest threat to his master’s plans, and he needs to be taken care of. Rather than simply killing Thrall, Fandral splits the shaman’s spirit into the four elements and sends them to the four elemental planes of the Skywall, Abyssal Maw, Deepholm, and Firelands. The Aspects seem unable to help him, so Aggra decides to take matters into her own hands and task the player to go with her and help restore him to one piece. This is when we see the different sides of Thrall, and the emotions that he has been trying to keep together for years. Doubt, desire, patience, and fury are all expressed during the different parts. There have been times where he has shown certain parts of this through the game, but never have they been out of control. The elemental planes have enhanced these senses, so you and Aggra have to restore him to as close to normal as possible. There have been some good conversations on Twitter that I’ve seen, mainly between WoW Insider staffers, arguing about what this quest line does. Does it establish Thrall as more of a fleshed out character, or does it make Aggra a major character with Thrall as the sidekick? Personally, my thought is that it’s a bit of both. Thrall is given more depth as a character, but the problem that I see is the fact that he’s being set up as an uber-character, and very close to the Mary Sue problem of Rhonin. He’s going through this whole ordeal to basically “cure” his major character flaws – the fact that he has had the problem of controlling his emotions. After this, what else is there to make him realistic? I have really enjoyed the progression of Aggra’s character. She was annoying at first in The Shattering novel by Christie Golden, but by the end of the book I had grown to like her. After having a small role in the Lost Isles part of the Goblin starting experience, we don’t see her again until she ferries the character into Deepholm. This quest line makes her much more believable and has more of a personality, especially during the Deepholm parts where she gets mad at Thrall for being so stubborn. Nothing will be perfectly written. In all of the stories written, people can nitpick parts of a character for parts that they don’t like. However, getting as realistic as possible is the ideal dream of an author. With these characters being in a persistent world that is constantly being written, there’s more of a chance for them to have more development in the future. My concluding thoughts is that the characters are written well, but I believe that Aggra shines more than Thrall in this part. I really like both characters, and having most of my history being a Horde player I’ve had a man-crush on Thrall at times for being awesome. It will be interesting to see how Mr. Metzen and the creative development team takes the story forward. It’s not just any Tuesday today. Maestro, please begin the ominous music. 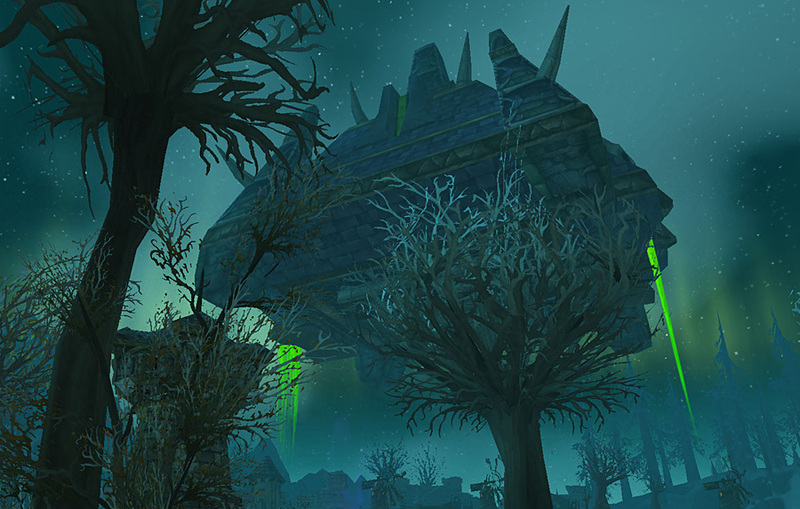 Today is when patch 4.2 hits North American/Oceanic realms for World of Warcraft. It’s been just over six months since Cataclysm was released, and our first major content patch with new and exciting things to do. We technically have had a content patch already, but redoing two existing instances takes a lot less work than a whole new raid and daily quest hub. To say that there are a lot of changes is quite the understatement. I will be referencing links from WoW Insider throughout, and the best place to get a run down of the major changes is their guide to patch 4.2. The major points of the patch are the inclusion of the Firelands raid and the Molten Front daily quest hub. Ultimately defeating Ragnaros once and for all, the raid also includes the chance to get a new DPS caster legendary staff. Similar to the Isle of Quel’Danas, the Molten Front area is a daily quest area that advances along with personal progression (I touched on this on a previous article). For the first time with a patch, we actually have explanations for the class balance changes that came along with it. Ghostcrawler took every single change and said why they made them in point form. Rather than just saying “here you go, deal with it”, we at least have an idea of the philosophy the developers use when making their decisions. There are a great number of changes, best to take a look at which ones apply to your own class(es). Another great change is the Dungeon Journal, which includes a version of AtlasLoot. Once again we see Blizzard taking addons that they like and feel should be part of the default UI and incorporating them. The Journal has information all the fights of Cataclysm content (will be expanded for the rest of the game eventually, I’m sure), along with abilities that the bosses use and gear that can drop. Currently there is the gear information on the Battle.net website, but this is a great way so people don’t have to use a third-party addon or alt-tab to find out what drops from a certain boss. Lastly, one of my favourite things about 4.2 is the inclusion of a great cosmetic change. Since I’m back to being feral DPS, I can be a flaming kitty! I believe that it only requires the person to have the staff that drops from Fandral, and whenever you’re in cat form you become a cat… on fire. Dragonwrath turns the caster into a dragon with a proc, but it looks like this is a passive cosmetic change. I hope that this opens the door for more cosmetic changes down the road, as we really need them – especially for druids. We have great gear, but in combat we’re in the shapeshift forms and are unable to see the great looks. The community has been asking for changes such as this for years, so hopefully we’ll see more down the road. New content is awesome. I know I’ve been getting impatient, as this six month period since Cataclysm released seems to have gone by very slowly. Hopefully I’ll be able to raid the new place, for the main reason of becoming a flaming kitty. Otherwise, at least I’ll have the new daily quest area to keep me busy for a while. A little while ago, something happened that caused me quite a bit of frustration. In essence: I love to raid, but I was denied the chance to raid. I was mad at first, but after having the chance to reflect upon it I have some thoughts to share. Being in a guild comes with rules attached. This is even more important for guilds who raid, as there are the intricacies of determining who gets loot, discipline for people being jerkfaces, attendance issues, among other things. What is the rule for who gets to raid? Some back story to begin with, as my situation is a bit weird. I’ve mentioned before that I can’t raid as much as I used to, due to real life circumstances. I am married to a wonderful woman and have a great son. Unfortunately I don’t make enough money to support us all by myself, so my wife has to work part-time on weekends and some evenings. As it happens one of the nights she usually works is a raid night, and the other raid night is one where I work late every second week. Therefore, due to our work schedules there have been many times where I have been unable to raid because of having to look after our son or because I’ve been working. Prior to The Spawn arriving, I was a regular raider. From Vanilla all the way through Wrath, I was there for a majority of our guild’s raids, so I have good experience. I’ve been in the guild since it was formed, so I have tenure. Plus, I enjoy raiding as it’s my version of a “guy’s night out” or poker night. It happened that this certain Friday, I wasn’t working late and had been given the all clear to sign up for the raid. We’re doing 10-man raiding right now and eleven people had signed up – since I’m a DPS class, my role is always one that’s fought over. This was my first time being able to sign up for a raid in over a month, but I had experienced most of the content in the expansion thus far. The night’s agenda was to go to Throne of the Four Winds and work on Al’Akir, as he’s the last boss we need for the Guild Glory of the Raider achievement. I logged on, asking if I was going to be able to raid that night. The decision was made to have myself and another DPS do a /roll with the low roller sitting the night. Ultimately, mine was the low roll and I was out. To say I was mad was an understatement. The arguments came to my mind very easily: I’ve been a member of the guild for years! If it wasn’t for my situation, I would have been there for every raid! I deserve equal chances to participate in the raid! Other people go to every raid, but I have the rare chance! Why do they go but I get shut out? Almost a week later, I’ve looked back and realized that the decision was made properly. I wish that it was made ahead of time so I would have known, but that’s beside the point. It was a progression raid, and the people who have worked at the content for weeks deserve the chance to get a guild-first downing of a new boss. There needs to be a balance for inclusion of all members who want to raid. I’m not suggesting that just because you’re a warm body means that you should go, but given a chance. If the raid agenda was to do content that was being farmed, my anger would have been justified. Since it was a progression night, it was not my place to take the spot of someone who has been there all the time. Because of the above reason, there is definitely a reason to put the proper people in a raid. Whereas I may be someone who knows what to do, I truthfully didn’t deserve to take the spot on that night. Obviously there are times when it’s not possible to be picky. If there’s only 10 people on who can raid, you have your raid. Depending on the skill and gear levels of the people involved, that will determine what will happen that night. Progression may not be possible, but it will likely be possible to bring up other people to the point of being able to progress later. If there’s 15 people who want to raid, there are going to be five people who will have to do something else. Should the plan be to progress through raid content, the obvious choice is the people who are ready for the content. However, there must be a chance given to people who want to raid. It’s just the timing that needs to be decided on. Firm communication between guild leadership and the members is key. If the plan is to do progression, make sure people know that preference will be given to those who are geared and ready for the fight. For farm nights, some preference should be given to people who need to gear up. All of this must be done within reason. A whole raid full of people who need to gear up won’t go very far in a raid. I’m not saying that those who can’t make every raid must be given a spot on farm nights, but to take their situation into account. I love to raid, as it’s something that I enjoy doing with the friends that I have made through World of Warcraft. My schedule limits the times that I can raid, because of the schedule my guild has established. In the meantime there are PuG raids that I could join, there are Zandalari heroics, and upcoming single player content in 4.2 that could make me pass the time. Lots of things to do, and hopefully raiding with my guild will be one of those things again in the future.